Rawn AmericaT Anti-Static Glass and Plastic Cleaner removes dust, dirt and fingerprints with a non-drip, spray foam application. The foam cleaner stays put and does not run down vertical surfaces like computer monitors, so there is no damage to interior electronic components. The citrus scented cleaner uses organic compounds in a water-based, non-flammable preparation that eliminates high VOC content. The environmentally conscientious cleaner does not deplete the ozone and meets the new California 2000 standards with less than 12% VOC content. When applied to glass and plastic surfaces, the spray foam evaporates leaving a thin layer of protection that resists electrostatic charges. After cleaning, the product continues to prevent electrostatic buildup from reappearing dust and dirt. The cleaner cuts oil and grease on contact. Tough stains can be removed using a soft cloth. Unlike a general purpose foam cleaner, the Rawn America cleaner does not streak, smear, or leave a filmy residue on plastic or glass surfaces. 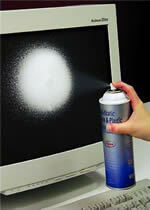 The foaming aerosol removes oily films while maintaining peak operational efficiency for electronic components. The cleaner can be used for commercial, industrial, manufacturing, automotive and general home office maintenance. The new Rawn America product effectively cleans and protects computer monitors, keyboards, photocopiers, printers and office equipment. Non-corrosive and non-abrasive, it's safe for plastic, glass, metals, and elastomers.